It is been a while since I’ve heard any new rumors about the Apple TV set. So far, I’ve heard the TV set called the Apple TV, iTV, and now Apple HDTV. 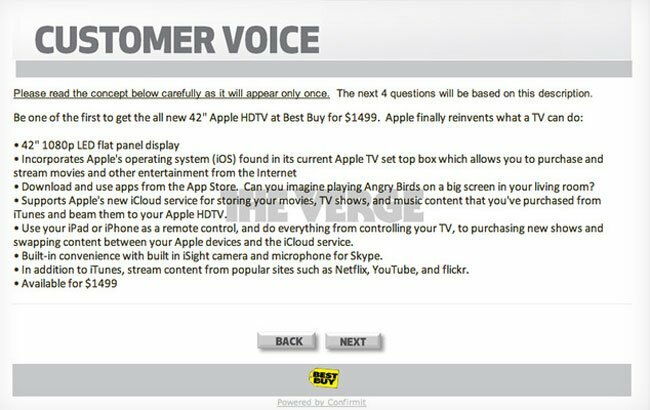 Best Buy is apparently running some sort customer survey on their website asking people questions about the Apple HDTV. I wouldn’t think they have any insider information, even though the survey gives up some details. I would bet the details are things that Best Buy has made up simply to gauge if customers are interested in the TV and at what price they would be willing to buy. According to the survey, the set has a 42-inch full HD resolution screen, runs IOS, and supports iCloud for storing content. The customer survey says that the TV would be $1499 and would have an iSight webcam for HD Skype. I don’t see Apple using Skype with anything it makes, it would be Face Time instead. This is a very strange survey for Best Buy to run, what do you think?